Jamo's A 102 HCS 5 likes to think of itself as an easily-digestible 5.1 speaker package: comprising a small centre, four even smaller satellites and a boxy subwoofer. But it's worth noting that each of these speakers are available individually, so the system can be upgraded to a 7.2-channel conﬁguration if you want, without intruding too much on your living space. And because you're dealing with a pukka, respectable manufacturer, you actually stand a reasonable chance of having your order fulﬁlled, even if the extra speakers are ordered sometime after the main system. Even so, systems of this kind inevitably come and go fairly quickly, so don't leave it too long before ordering the extras. The speakers are small but well made and come ﬁtted with wall brackets, but while the satellites' terminals are big enough to accommodate 4mm plugs, the plugs and attached wiring won't clear the brackets without fouling the wall behind, so you'll probably have to use bare wires anyway. Stands are available as an optional extra. The subwoofer has line and speaker level inputs, and adjustable settings for level, handover frequency and phase adjustment. So the key question one is how does the Jamo system cope with the acid test – sound quality? The short answer is rather well. Fired up, the Jamo system reﬂects its physical size; imagery is rather small and oddly distant, and the midband and upper midband have a raw quality. The sound is clearly compressed, as though it has been squeezed out against its will from the tiny enclosures. However, these things are more or less inevitable with all small, low-cost speakers. The lack of aural expansiveness is certainly tied to the dinky size of the satellites, and the rawness is a function of the tiny 3in drive units. The subwoofer is more a supplementary bass output device than a true sub. Turn it too high and you get an attractive additional warmth, coated in a rather sluggish texture, and little real subterranean depth. Again, no surprises here. But criticism is cheap, especially when measured against the A 102 HCS 5's cost and packaging, which are low and diminutive respectively. The system is listed at £330, but is widely available for just £200. With a range of home cinema material, and mainstream audio from DVD and a Sky+ box respectively (likely system matches) the A 102 HCS 5 is sufﬁciently involving, without an excess of emphasis at any part of the audio frequency band. And with the lightweight midrange balance, which is part of the system voicing irrespective of the way it's set up, speech comes across as relaxed and intelligible. The fact that the centre speaker is larger than the other satellites is maybe responsible for giving dialogue that extra bit of body, weight and depth. 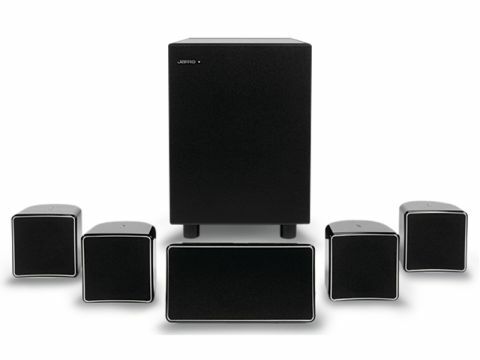 The A 102 HCS 5 is a good choice for those looking a for a low-impact, limited cost sub/sat package. Be it for a den or smaller room, it's well worth investigating, and you'll be hard-pressed to ﬁnd a comparable rival system at a similar price.